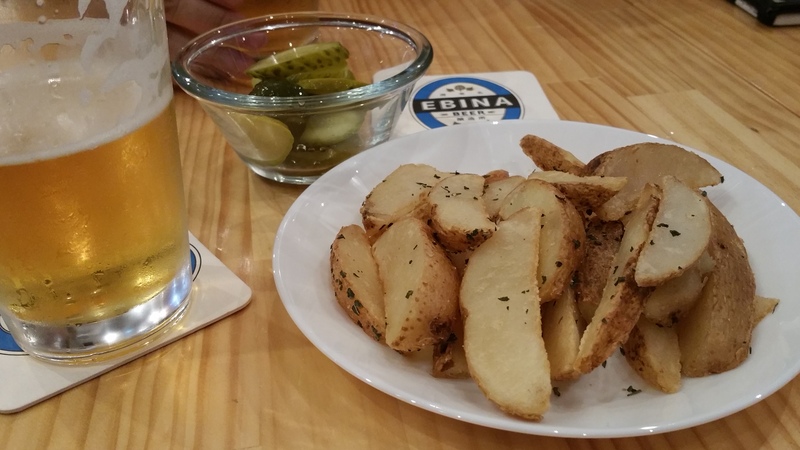 I liked Ebina Beer a lot – a nice little friendly place with a good chilled atmosphere about it that is easily accessible if you live on the Odakyu line. The whole place is non-smoking and there was no table charge either when I went. What more could you want? Reasonable prices? You got those as well. The brewery is now up and running and the in-house beers are as tasty as the Nihonkai guest beers as well. If you live on the Odakyu line or live near then there is no excuse – get along and drink some well made beer. Ebina has always been, in my eyes, a place of change. I’ve always changed trains there to get onto the Odakyu line, either to go towards Hakone or up to Machida at some point, or even to go down to Kagawa for the Shonan Beer Oktoberfest. I’ve never stopped at Ebina, except for one time, and I don’t wish to expand too much on it but it was to go to that bastion of Australian cuisine – Outback. Yet, over the last few years of passing through Ebina, I’ve noticed it changing – new shopping centres, new shops, new buildings, and now a new brewery. Ebina Beer opened in February 2017 (7th February) to be precise in an area of Ebina that is devoid of anything but shopping places. The plan for Ebina Beer is to be a full working brewpub, though due to problems with electricians and plumbing has meant that plan has been delayed until September, though at the time of writing, some of the beers have begun to be brewed in-store. Ebina Beer is located about 10 mins from Ebina station, situated on the junction of three train lines – JR Sagami Line, Odakyu Main Line, and also the Sotetsu Line – so there’s no excuses in not being able to get here. Inside Ebina Beer, there is space for about 16 people at tables and also about 10 people at counters located at the bar or by the main window looking out across the street – so you can watch people while they shop. 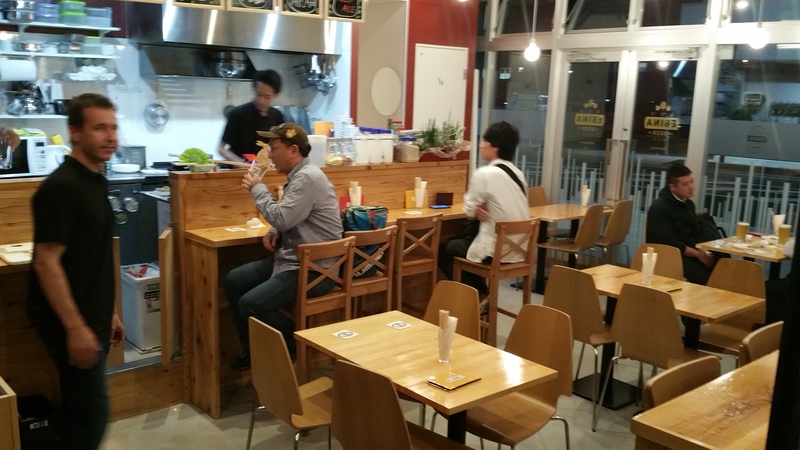 The bar is completely non-smoking and also doesn’t have any table charge – two things we love at BeerTengoku. However, Ebina Beer is a funny little place – it appears to be quite spacious but is in fact quite close, so make sure you pull those chairs in close. Eight beers on tap – either Nihonkai or in-house brews. Ebina Dark Lager – damn good. The lineup at Ebina Beer is split between Nihonkai Beers, based in Kanazawa, though they are a great brewery and I REALLY recommend trying them if you come across them, and also in-house beers from Ebina Beer. Ebina Lager is supposed to be the de facto main beer along with the Ebina Pilsner. The beers come in two sizes with a 1/2 pint (260ml) for ¥500 and a pint (480ml) for ¥850, with all prices inclusive of tax. They also do takeout beers of pint size plastic cups for ¥800 yen – something I took up on on the journey home. I didn’t notice any beer flights on at Ebina Beer but next time I go, I will check. With a Czech background at Ebina Beer, I was surprised to see a lack of Czech food and snacks on but I guess Japanese people may be adverse to it. The menu consisted of simple snacks such as pickles, sausages, and of course chips, along with some larger dishes of curry as well. The menu was in Japanese, as well as English, though if Tom is there, he can help explain in English what is on. Closed: Usually Sunday but check their Facebook page for more details. Ebina Beer is located about 10 mins from Ebina station, situated on the junction of three train lines – JR Sagami Line, Odakyu Main Line, and also the Sotetsu Line.